Bags are one of the essentials in a woman’s everyday life. Often, women tend to bring either a handbag or tote bag when they go out. So, what’s the best promotional item that can be used to go along with a magazine? It is none other than a simple yet fashionable mini tote bag. Read on to find out more about this on pack promo. Simply spend HKD$ 20 to purchase this on pack promo containing the Jessica magazine and a mini tote bag. This promotion was spotted at a convenience store in Hong Kong, called Circle-K. A very prominent convenience store that is located at almost every corner in Hong Kong. How this on pack promo help boosts sales? The main target market of Jessica magazine is the woman. By offering these mini tote bags as an on pack promotional item, it would definitely be able to attract more women to purchase their magazines in order to receive the tote bags. Some people may even purchase this on pack promo just for the mini tote bags and not the magazine. This way, sales could be boosted greatly. Furthermore, these mini tote bags come in five different colors, purple, pink, turquoise, white and red. This variation in colors of the tote bag may attract more customers to purchase their magazines. 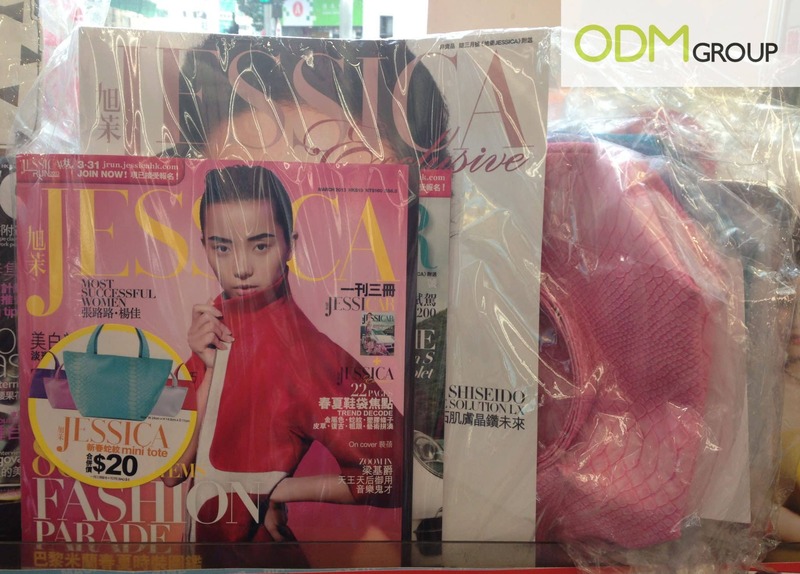 People may try to collect all the different colored tote bags, which would generate more sales for Jessica magazine. Branding these tote bags with your company logo could help build brand awareness. Customers who constantly use these tote bags would be reminded of your company name. And this may eventually build up brand loyalty. Free walking advertisement is also possible, as customers would be carrying these tote bags wherever they go. Therefore, other people would be able to notice the brand logo and learn of your company.